We are back again with Armorcast, our Model Terrain Company of the Month. We all know that models are our little actors and that the gaming table is our stage. The setting and backdrop is the terrain. All are equally important in pulling you into the game and enhancing your hobby experience. What about selling it? I’m not talking about hocking your terrain, I’m talking about taking it to a level that pulls you into the scene. Whether it’s water effects or smoky cotton, these little extras really sell your display or gaming environment that you worked so hard to set up. What about your models, your little actors? Rippling water is cool, yet your actor is missing something. They seem apart from the scene instead of in it. Armorcast has just the thing to make your models actions come alive. Armorcast Cinematic Effects take that final step to sell that scene. Muzzles flashing, guns blazing, las weapons shooting hot lances of energy at your foe. They have it in all sizes. Missiles firing, shell casings ejecting, or my personal favorite, spraying the purifying, ever holy, hot promethium on your foes. They also have a variety of explosions from grenades to exploding pieces of vehicles. Following up explosions is rolling plumes of smoke help sell the scene of burnt out vehicles. Lastly is one of my favorites for jump troops. I always thought is would be really cool to have a squad of jump troops in multiple stages of the jump, dynamically moving towards the enemy. One thing that has always been missing was the blasting off effect. 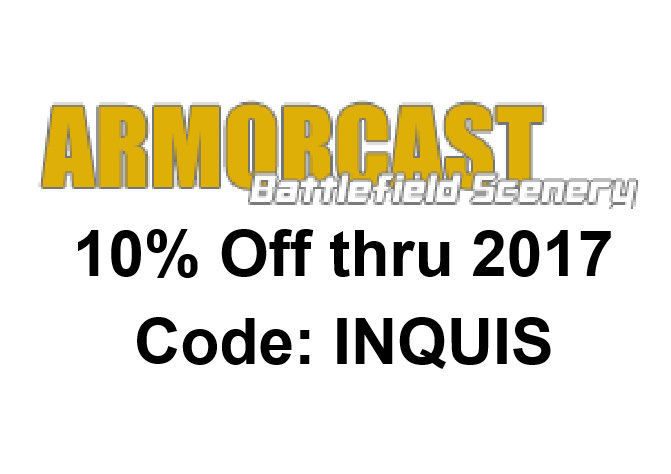 Armorcast has that covered too. Check these out. Go and check out all the Cinematic Effects from Armorcast and get inspired to sell your own scene. Armorcast was kind enough to send me kits to give away to our listeners. Give the Armorcast Facebook page a ‘like’ and stay current on their latest releases. Expect more great stuff in the weeks ahead.